I have to say I was surprised by the feel of it and the handle feel. Its not a battle ready sword by any means but it is more than I expected. 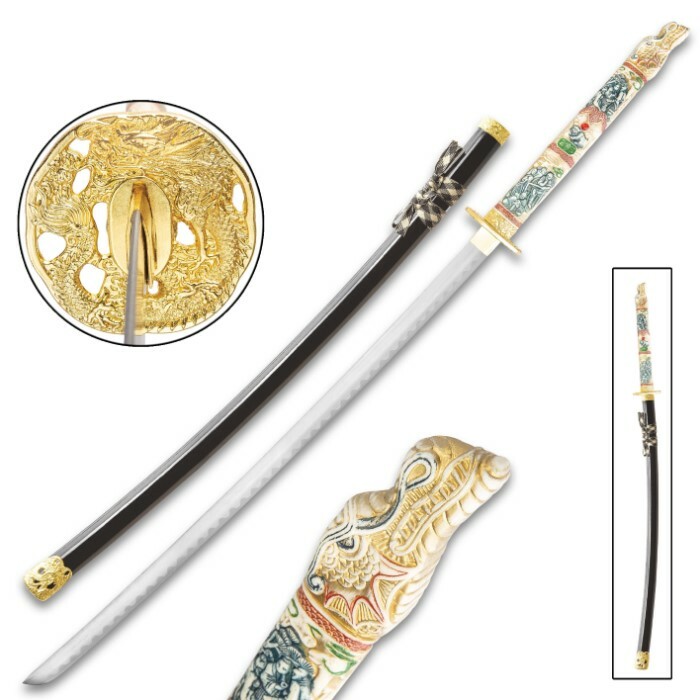 The only negative I can give at its price is that I ordered it engraved...DONT WASTE YOUR MONEY ON ENGRAVING...the lettering on a full sword was so small you have to look for it, rather disappointed in the engraving and the fact that no description of what you are getting is given. Just got this sword and it beautiful! I've always wanted a Highlander sword and now I have one. Granted this is meant for display not a battle ready weapon. However, it is full tang. Mine came semi sharp. I've since sharpened it further. Now it a back yard cutter for sure! 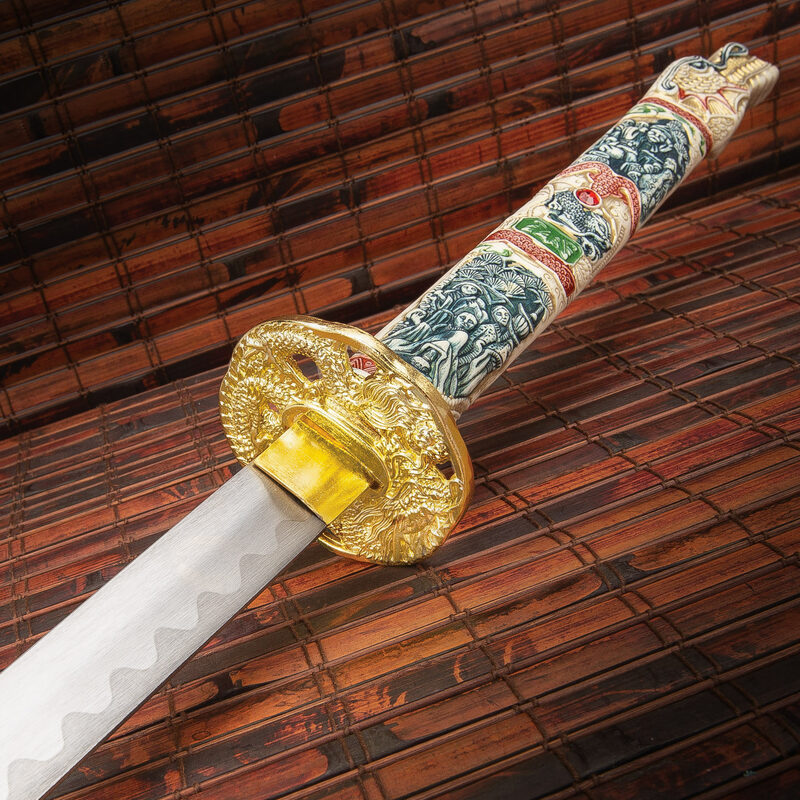 Only thing is the scabbard does have a lot of wax on the inside that rubs off on the blade every time you draw the blade. However, it does clean off rather easily. Over all great buy for the price. Thanks again BudK!! Thus far I have been happy with the condition of this product. I have not inspected at depth yet, but I don't forsee any issues. Thank you BudK! I'm impressed by the details of the sword. It's not too heavy or too light. The handle is bigger than I would have anticipated. It feels great to use it as a practice sword. I look forward to collecting more swords in the future. Thank you. This sword came about week faster than it was supposed to. It had a very slightly bent blade. There was a small sharpening error at the bottom of the blade, but that might have been partially my fault from when I was sharpening it. It was fairly sharp when it arrived. The sheath has tons of wax in it, but the wax is easy to get off and there is never as much wax as the first time you remove it from the sheath. Overall, pretty good sword. It looks beautiful, although the handle doesn't look as good as I expected. Still a great decoration. I'm impressed with this sword; it is sturdy, not shaky at all and, if not sharp at least can be sharpened. The design, the paint job and the overall looks of this piece makes it one of the best i've seen so far. only good for show. the gold finish on the tsuba was cracked and flaking.